Plain to Fancy in just a few hours! 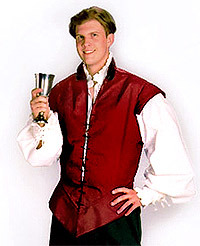 Here are instructions on how to take a plain English Lace-up Doublet and make it into a nobleman's vest (Figure 2). 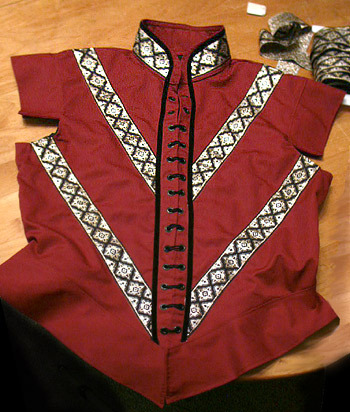 Once you know the tricks for adding trim to finished garments you can easily customize all of your wardrobe. 2-1/2 yards of 1/2-inch velvet ribbon. or, needle and thread if you choose to sew the trim on by hand. Wide trim looks best when used on straight lines. For curves, use narrow trim, ribbon, or braid trim. Braid or gump is made from cords, woven or knotted in various ways to make decorative trim. Braid bends easily around curves; however, the ends are difficult to finish and hide. Tailor's chalk contains a small amount of wax to keep the chalk from brushing off the fabric too easily. 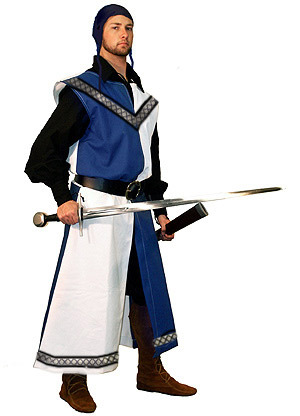 It comes in squares of blue and white chalk for dark and light fabrics. You can use small pieces of soap as a substitute. You can use a yardstick, t-square, or any other straight, flat object for the straight edge. A measuring tape will not work. Step 1: The secret to adding trim successfully is drawing guidelines first. 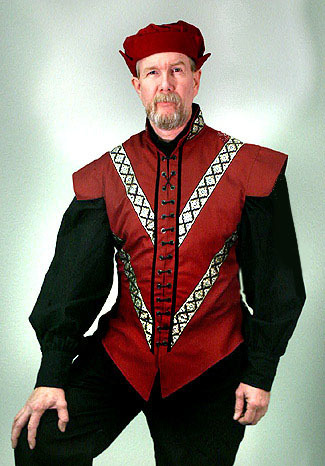 To trim the doublet in a pattern of large "Vs" mark the midpoint of the back with the tailor's chalk. Make a mark on each of the shoulders 1/2 inch from the seam. Using the straight edge, draw a chalk line to connect these marks (Figure 3). Draw lines for the lower "V" from the waistline center back to the armholes parallel to the upper "V". Step 2: Turn the doublet over and remove the laces. Draw a verticle guideline 1/4 inch from the grommets, parallel to the front edge (Figure 4). 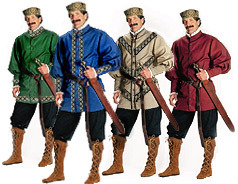 This is the guideline for the velvet trim. It also defines where the wide trim will end on the front. Do not draw the line too close to the grommets or you may break your sewing machine needle when sewing down the trim. Step 3: Make a mark halfway down the front, next to the grommets, on each side. Connect theses to the marks on the shoulders with a chalk line. 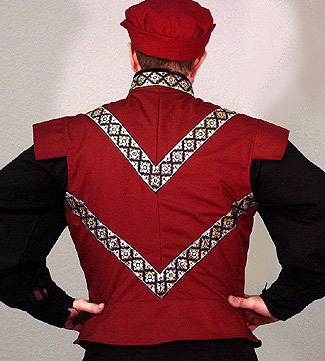 Draw lines from the lower center front to the armholes, parallel to the upper "V", as on the back. Step 4: Starting at the midpoint on the front, measure the guideline from center front, over the shoulder, to center back. Multiply this distance by 2 and add 4 extra inches for insurance. Cut the wide trim to the calculated length. Step 5: Match the pattern and fold the wide trim in half with right sides of the trim together. Cut from one corner of the fold to the edge at a 45° angle (Figure 5). Sew or serge the cut edge. 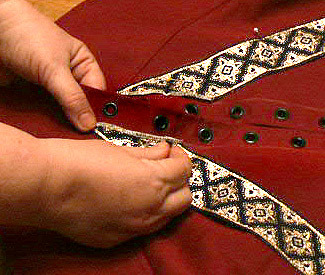 Open the trim and pin to the midpoint of the back with the guidelines at the bottom edge of the trim (Figure 6). Depending on the angle of the "V" you may need to make some adjustments to the sewing line angle. If you match up your pattern when you fold the trim, your mitered corners will be symmetrical. 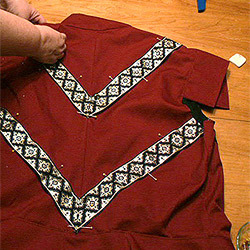 Step 6: Finish pinning the trim over the shoulders (Figure 7). You may need to take a small tuck as you change angle at the shoulder line. Step 7: Measure the lines on the lower back "V" and cut trim 3 inches longer. Serge or zigzag ends to prevent fraying. Match the pattern and fold in half with right sides together. Cut and sew a 45 ° angle as before. Pin the lower "V" in place using the guidelines. Fold the excess trim into the armhole and pin. Step 8: Turn the garment to the front and lay the trim on the guidelines on the front. 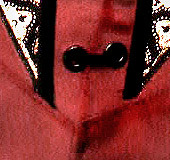 Mark where the trim crosses the guideline next to the grommets. Cut the end at that angle and serge or zigzag the edge to prevent fraying. Do not go over the line or fall short of it by more than 1/4 of an inch (Figure 8). Step 9: Pin all the trim in place on the front. Sew the trim down with the same color as the background of the trim. Sew very close to the edge starting at the lowest point in the front, next to the guideline. Follow the guidelines closely as you sew. When you get to the armhole, turn and sew across the end trim so that you sew down the folded part of the trim on the inside. Then turn and proceed back to the beginning on the other side of the trim to fully attach it to the garment. 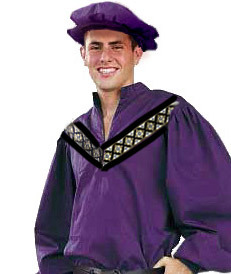 At all times be careful to keep the garment from puckering under the trim. Repeat on the other side of the front. Step 10: Repeat the procedure to sew down the upper "V". When you reach the shoulder keep going, following the guideline. 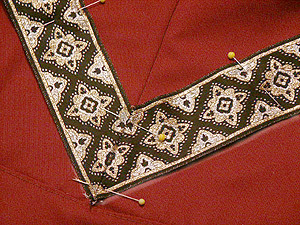 Sew the back "V", then sew over the other shoulder to the front grommet guideline. Sew down the angled end of the trim, and then sew down the other side of the trim all the way around until you reach the beginning. Step 11: Cut a piece of trim a little longer than the collar. Match the pattern and fold in half. 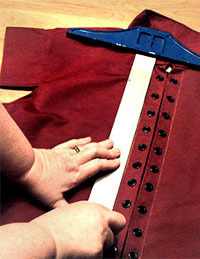 Pin the center of the fold to the center of the back of the collar. Pin the rest of the trim on the collar. Cut the trim to match up with the guideline and the curve of the collar. Step 13: Sew black velvet ribbon over the front verticle guideline and the edges of the trim to give a finished look to the garment (Figure 9). Turn the end of the ribbon under at an angle to make it look neat (Figure 10). Sew across the end, then sew close to the edge of the ribbon up the front of the doublet, around the neck, and down the other side. Sew both sides of the ribbon close to the edge, making sure that you cover the ends of the wide trim. Washing instructions: Use only washable trims. Prewash and iron the garment before attaching trim. 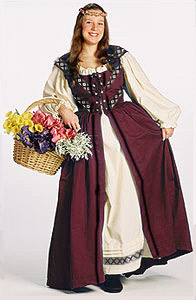 If the garment is machine washable, like this doublet, turn the garment inside out and button or lace-up before washing. This will protect the trim from abrasion on other garments. Wash in cold water and hang to dry. Unbutton and iron from the wrong side. Touch up ironing on the right side but avoid ironing metallic trim. 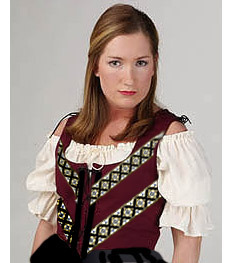 Variations: Other examples of how you can customize garments with metallic trim and velvet ribbon. Click on image to go to product. If you want to add this article to your list of favorites or email it to a friend, please use this permanent URL, https://stores.renstore.com/-strse-template/0511A/Page.bok. Permission is granted by the author to quote from this page or use it in handouts as long as you include a link back to Renstore.com.